REAL-LIFE TELLY: A Grovedale family are set to appear on a new reality TV show. A Geelong family will battle it out for $25,000 in a new Australian reality TV show premiering on Sunday. 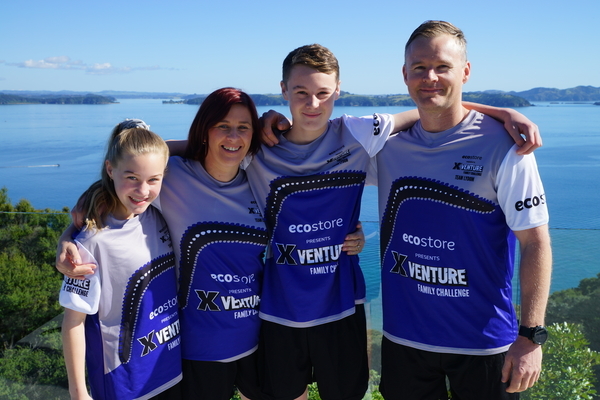 Grovedale couple Jase and Karen Lydom are among the contestants set to compete on the new series of XVenture Family Challenge. The pair will star alongside their 14-year-old son Lochie and 12-year-old daughter Poppy. Ms Lydom said her family decided to apply for the show after they saw a casting call on Facebook. “One of our friends tagged us in a post by XVenture asking families to take part,” Ms Lydom told the Indy. “It caught our attention – we thought it sounded like a fun thing to be part of and a great experience for the kids. XVenture Family Challenge is the first series of its kind to air in Australia, following a successful stint of the show in New Zealand, according to promoters. This year’s series includes both Aussie and Kiwi families. “The show was filmed at Eagles Nest in the Bay of Islands which was incredible,” Ms Lydom said. Hosted by TV personality Kate Freebairn and award-winning musician, Jason Kerrison, the series will see 16 families compete over four heats. Teams will engage in a number of mental and physical challenges, ranging from navigating inflatable obstacle courses to flying drones. Ms Lydom said the show is true to the meaning of “reality”. “All of it is real, nothing is scripted or staged – what you see is what actually happened,” Ms Lydom said. The family-of-four will compete under the name Team Lydom in an array of challenges each episode. “The teamwork, communication and collaboration required throughout the show definitely put our family dynamic under the spotlight,” she added. “My kids loved it – having to work as a team allowed them to take on leadership roles and develop resilience, too, which was great. Ms Lydom said her family have discussed how they will spend the prize money if they were to be crowned victorious. “We have a family trip planned for America later this year so it would be great to put some more cash towards that,” she said. XVenture Family Challenge screens on Channel 10 on Sunday.